Make a splash at this poolside restaurant with an eclectic and mostly healthy menu. 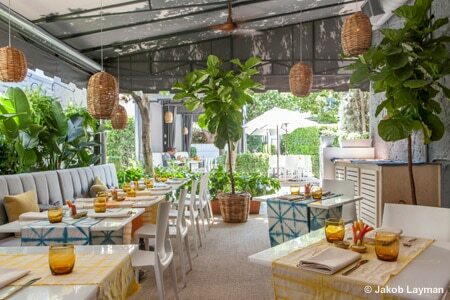 About the restaurant: With a focus on wellness and clean eating, this hip and haute eatery, located poolside at Avalon Hotel, offers a chef-inspired menu for breakfast, lunch and dinner. Food & Drinks: Mornings are made for granola with acai bowls, yogurt parfaits and egg-white omelets. The all-day avocado toast is a treat with whipped cream cheese, heirloom tomatoes, red onion and watermelon radish. For lunch, consider the shrimp tacos or Kalbi beef wraps with marinated hanger steak, gochujang aïoli, kimchi, mung bean salad and butter lettuce --- a fusion of Asian flavors. The full bar features (what else?) “Skinny” cocktails, which makes the svelte set feel less guilty. Aside from the berries and cream offering, most of the desserts are not as “skinny,” but well worth the guilt. New Orleans beignets almost rival those served at NOLA's Café du Monde. Olive oil cake, complemented by red wine poached pears and vanilla bean ice cream, is moist and flavorful. Both pair nicely with the French press coffee.